how is it different than other methods? We are in conversations every day and research shows that 9­ -10 conversations miss the mark. Sometimes people may say to you, “I don’t have time to spend in deep conversations – they take too long.” By mastering Conversational Intelligence, what normally could take months or even years, can happen instantaneously. Conversational Intelligence enables deeper connections to surface quickly with others. We see higher levels of trust, of partnering, and of co­creating behaviors. Our world is moving from an I­-centric world to a WE­-centric world. The power of Conversational Intelligence, as a new and innovative framework is profound. When implementing Conversational Intelligence in a large Pharmaceutical Company ­ the Company’s ratings in the eyes of physicians went from being rated #39 out of #40 (which is low) to being rated #1, #2, #3 in the eyes of Physicians ­ all within 8 months. A study researching the correlation between physicians and frequency of malpractice suits shows that by connecting with patients through conversations only 4 short minutes longer than the average physician, malpractice rates dropped to almost zero. You may have heard of EQ, Emotional Intelligence. Well Conversational Intelligence is the next generation of intelligences that enables us to understand how to move from I­-centric to “WE­-centric.” EQ is learning and growing the Self ­ which is “I­-centric”. It is about understanding our innermost thoughts and feelings and increasing empathy and understanding of others. EQ is about self-regulation (I­centric). C­-IQ is about Co­regulation (WE­-centric). Conversational Intelligence (C­-IQ) is about connecting, navigating, and growing WITH others. 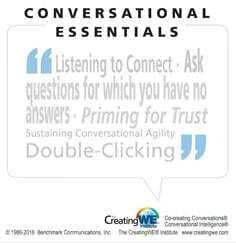 Conversational Intelligence provides us with frameworks for building TRUST, which is the human platform from which great conversations emerge. C­IQ provides new innovative frameworks for understanding how conversations shape our relationships, partnerships, our culture, and our reality. C­-IQ introduces new frameworks and tools for creating higher levels of trust, of activating higher levels of engagement, strengthening partnerships, and catalyzing co­creation and innovation in relationships, teams, and cultures. As we build trust with others, we strengthen our ability to EXPRESS our inner thoughts and feelings ­ which strengthens our relationships and creates mutual success. Once you learn what patterns drive connectivity and trust, and what drive fear and distrust, you can connect, engage, navigate, and co­create with others in healthy ways. 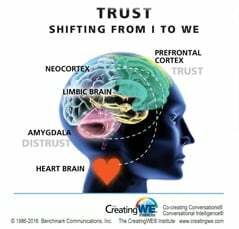 Conversational Intelligence elevates Oxytocin, the chemistry of Connection, and lowers Cortisol, the chemistry of fear and distrust. Understanding the Neuroscience of Conversations and applying this wisdom inside of companies transforms individuals, teams, and organizations ­ and opens new pathways for mutual success. As an organization or even for yourself personally you may have hired a transformational or leadership coach. What makes C­-IQ so unique and why C­-IQ coaches stand out from others is their deep awareness of Interaction Dynamics (‘tell and ask’;Advocate & Inquire, Share, and Discover) and how to use these dynamics to connect, navigate and grow with others in healthy ways. Because C­-IQ coaches are intimately more aware of how to build trust with clients and teams, they can uncover challenges and blind spots that were invisible before. This is not just a “how to” system it is a “know how” system. C­-IQ coaches masterfully support clients and teams to reveal their own deep awareness and how to express those awareness’ and feelings, which creates lasting and profound shifts in how individuals communicate and co­create, and how a company creates its culture. The amazing thing about C­-IQ is that it is something that can be cultivated and internalized. We are rewiring our brains to be healthier. It is the single most important intelligence in the world ­ and the greatest part is that the more we do it the better we get. And once you “get it” ­ it can never be taken away because it’s not just a how-to system that you follow ­ it’s wisdom you gain that gives insight into the patterns that drive deeper understanding of how to connect, navigate, and grow with others. Yes, there are frameworks, tools, and experiences that we share so that transformation can take hold, but it is an “in the moment” experience’ that builds toward C­-IQ mastery. C­-IQ coaches are adept at taking all the C­-IQ tools and frameworks and using them in highly creative and unique ways. C­-IQ is not a follow the numbers system, it is built for you, or your company’s growth needs as they unfold. C­-IQ is really such a unique way of engaging individuals, teams, and companies because you literally learn what is happening in your brains moment to moment. You will become a neuroscience expert! You can help yourself and others by self-regulating and co­regulating neurochemistry. You will learn how to create healthy organizations (interactions, teams etc.) through conversational rituals and uncover the wonderful worlds that emerge through the words that we share, the feelings we express, and the partnerships that evolve! 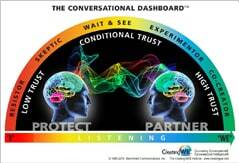 The Conversational Intelligence® methodology includes a suite of three powerful tools that enable you to gain insights into individual and group levels of mastery of the C-IQ principles. CONTACT US TO RECEIVE SAMPLE REPORTS OF ANY OF THE ABOVE REPORTS. Individual Coaching: We offer one-on-one coaching to support you in developing your Conversational Intelligence. 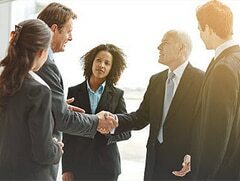 Team and Group C-IQ Workshops: Our C-IQ Workshops introduce your organization to the principles and frameworks of C-IQ to develop your team’s individual and collective Conversational Intelligence. Custom Team Workshops: We also offer custom-designed team and group workshops to work on specific business issues that enable to take your teamwork and communication to the next level using the tools and frameworks of Conversational Intelligence and other methods.